Starbuck and Boomer are shot down over the Sagittarian satellite world of Maytoria, now Cylon-occupied. The Sagittarian representative to the newly elected Council of Twelve informs the Quorum of the existence of a set of ancient books on the small outpost world of Maytoria on the outer fringes of the system. The books may provide a clue to the location of Earth. Unfortunately, it is now also occupied by Cylon forces. Commander Adama sends Apollo, Starbuck, and Boomer to retrieve the books in vipers equipped with newly adapted stealth devices. But the mission goes wrong shortly after the three fly into their target city and both Boomer and Starbuck are shot down. Apollo is forced to flee and warn the fleet the Cylons may now be aware of their presence. Boomer's unconscious body is taken by the Cylons and Starbuck is forced to hide out in the ruins. Starbuck scavenges a transmitter from another crashed viper in the city, but is caught out by a Cylon foot patrol. Just as it looks like he has used up his last ounce of luck, a pack humans moves in and takes down the Cylon squad. CONTINUED IN CLASSIC BATTLESTAR GALACTICA #2. Dynamite Entertainment has the bad habit of not naming the chapters of their comic book series. I chose "Maytoria" as the title myself, based on the name of the world the Colonials visit in this issue. This is the first of a number of "Starbuck left behind" stories that appear in the saga of BSG as produced by various licensees. At the beginning of the issue, Commander Adama states they've been fleeing the holocaust at the Colonies for a few weeks. This places the story around the same time as "Baptism of Fire". In that earlier story, he mentions not having yet run into the Cylons since leaving Carillon, which allows this encounter to fit neatly right after. For some reason, Commander Adama's subordinates are in the habit of referring to him directly as Adama throughout this story. What happened to the military discipline seen in the TV series where he was always respectfully called Commander? Starbuck wisecracks to Serina that he's going to bring Apollo back from this mission if he has to drag him a hundred hectars through the Aldarium Belt. The Aldarium Belt has not been heard of elsewhere in the series, but it must be a quite large astronomical body. The Colonial hectar is 1/10 of a Colonial parsec. The Colonial parsec is 90 million miles, so a hundred hectars is 900 million miles. Of course, Starbuck could be exaggerating. 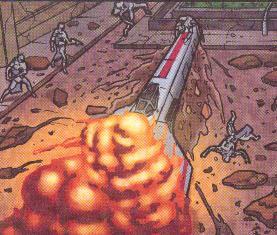 The image on page 4, panel 1 gives the impression that the three vipers have just blasted out of the front of one of the Galactica landing bays. Any true Galactican knows the vipers launch from the tubes on the sides. 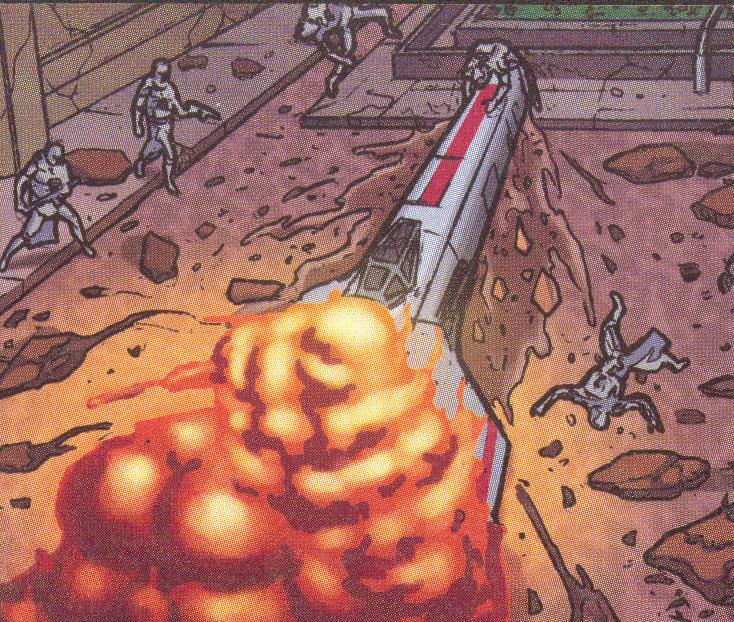 Looking closely at page 7, panel 1, it can be seen that the nose of Boomer's crashing viper takes out a Cylon centurion! On page 8, panel 3, the word "felgercarb" is misspelled as "feldercarb". On page 10, one centurion orders another to take Boomer's body to the IL at Station 32. This is in reference to an IL-series Cylon, a robot of the type that Lucifer is, with certain command and administrative responsibilities. When a new Imperious Leader is required, it is chosen from the existing ILs. Lucifer implies that IL stands for Imperious Leader in "A Death in the Family". Page 12 suggests, through Starbuck's inner monologue as he patches up his injured leg, that Athena thinks scars are a turn-on. Also on page 12, as he cauterizes his wound with a piece of hot metal, Starbuck notices that it smells like ventle steak on the grill. We don't get an explanation of what kind of animal a ventle is. On page 15, Starbuck decides he's having a ticophine fit and lights a cigar he's carried with him. Ticophine is not a real chemical, but is possibly the Colonial word for nicotine, which is found in Earth tobacco.